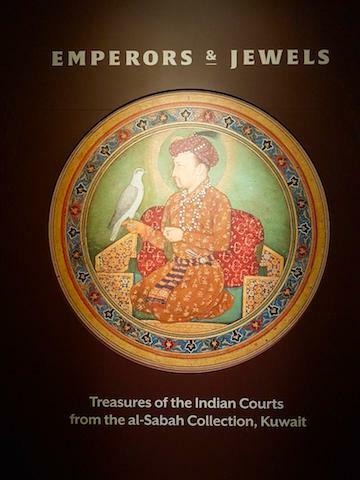 In the Toronto area for a birthday gathering, I decided to stop by the Aga Khan Museum to catch the Emperors & Jewels exhibition before its closing on 27 January, 2019. I'm glad I did. As expected, the exhibition is exquisite. 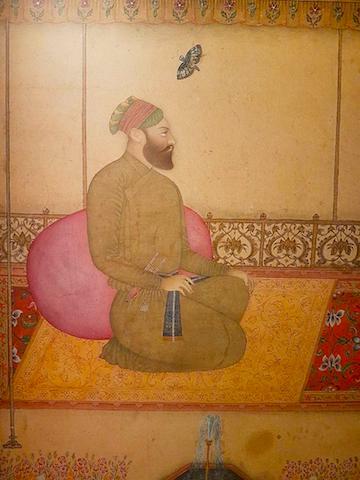 Its full name is Emperors & Jewels: Treasures of the Indian Courts from the Al-Sabah Collection. The Al-Sabah are the ruling family of Kuwait. 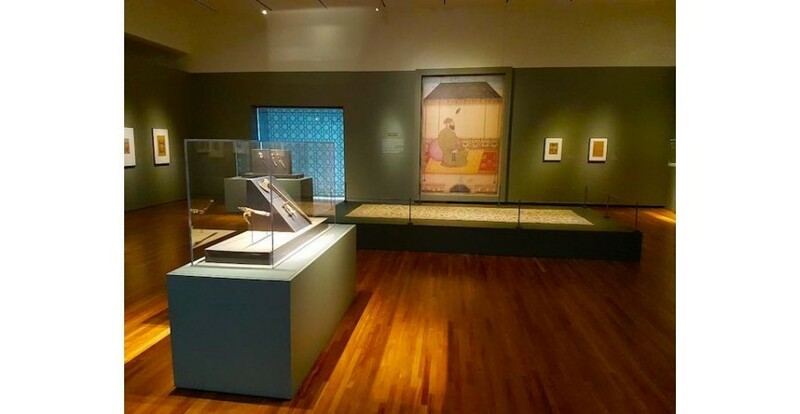 The highlights of the exhibition are Mughal artifacts from the imperial court in Delhi, but there are precious objects from other Indian courts displayed as well. For the most part, 17th and 18th century items are featured. It's hard to know where to begin. My eye was first drawn to a large carpet. 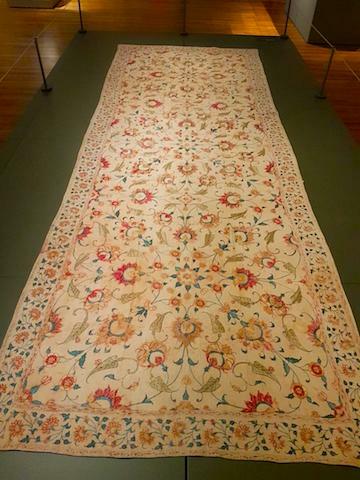 Identified as a floral garden carpet, it was made in northern India in the 17th century. The ruby tone of the carpet's background was picked up elsewhere by a hookah reservoir. 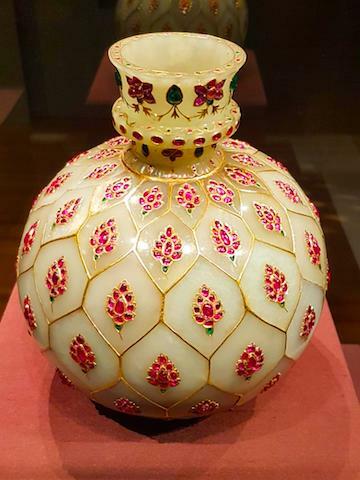 This beautiful jade artifact is inlaid with gold and studded with rubies and emeralds. As per the exhibition's name, jewels play a prominent part in the choice of objects. 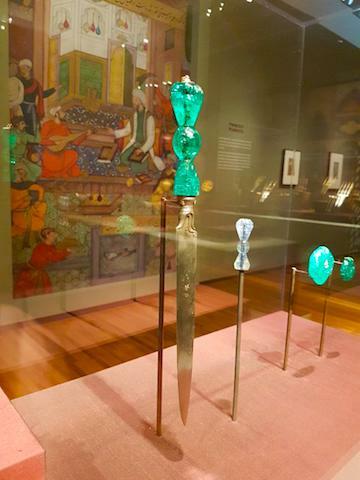 I neglected to note what the stone is in the hilt of the dagger pictured above, but it must be either jade or emerald. If you know, please comment below. While precious stones are the focus, there's also plenty of gold. Naturally, even the gold objects are studded with jewels. Textiles also play their part. In addition to the floral garden carpet above, there is a summer carpet. What makes it summery? Apart from the pale background, it's also much thinner than most Indian carpets you see. To help put it in context, the curators have helpfully enlarged a miniature that shows an 18th century ruler sitting on a similar carpet in a garden pavilion. 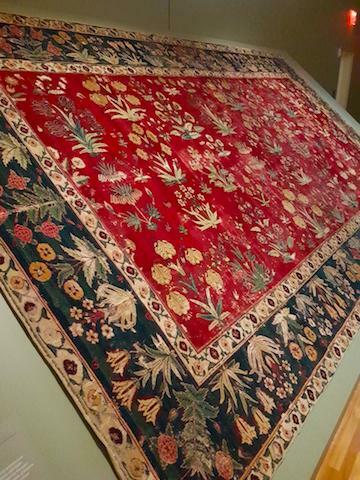 Note that the summer carpet is placed on top of what appears to be a thicker floral garden carpet. Other enlarged images strategically mounted around the perimeter of the exhibition provide historical background. 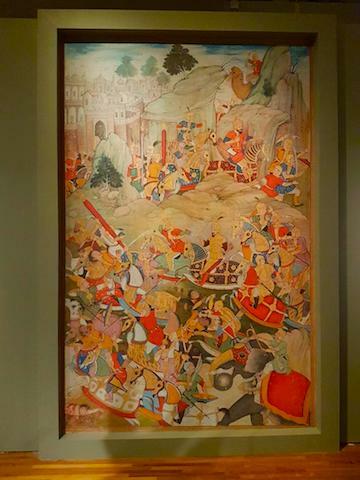 The one pictured below, for example, depicts the Mughal emperor Humayun defeating his rebellious brother Kamran in battle. If it's at all possible for you to get to the Aga Khan Museum by 27 January, I encourage you to catch this show. It's well worth the $20 ticket. 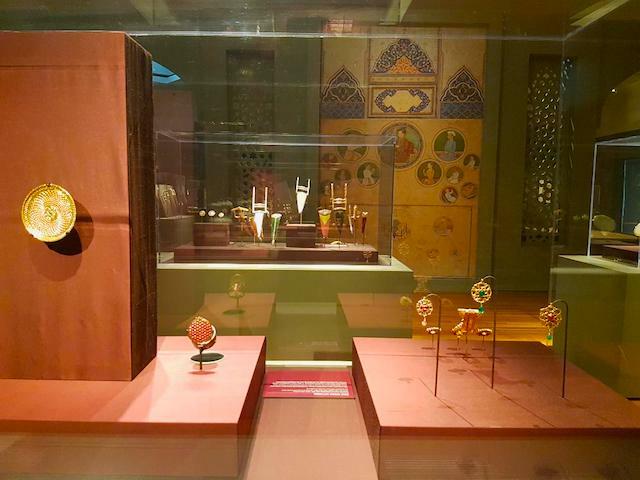 After marvelling at the treasures shown here and many others besides, you can also check out the permanent collection and another temporary exhibition that focuses on 19th century Iran. Not familiar with the Aga Khan Museum? I wrote a post about it after my first visit, back in 2017. You can read it here: https://lotusandpersimmon.com/lpshop/blog/96_aga-khan-museum.html . L&P checks out Toronto's first sake brewery.